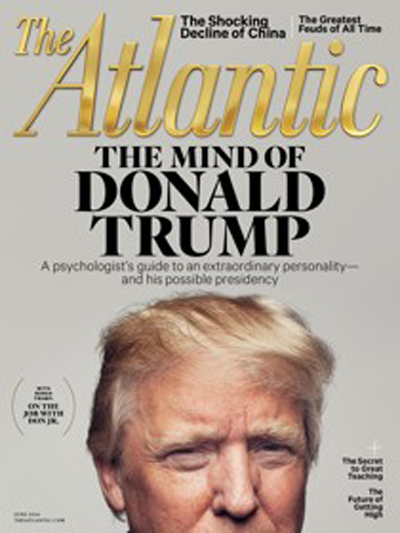 Although the current Atlantic's lengthy psycho-analysis of Donald Trump trumped the brief revival of the old claims about overcoming the achievement gap by Ronald Brownstein, one of the Atlantic's editors, the Brownstein piece should cause readers to note that the major pundits of corporate America and corporate "school reform" are as self-important, self referential, and impervious to the facts as is the Republican candidate for President of the United States.Ronald Brownstein published the same article in two major publications: On May 19, “The Challenge of Educational Inequality” appeared in the Atlantic and one day later “Fixing the achievement gaps” appeared in the Los Angeles Times. In the first section, Brownstein suggests that in order to “fix the achievement gap” we need to get educators to work harder, which will not happen unless there is constant testing to make them "feel the urgency" of helping all students. But research suggests that increased testing does not result in increased achievement. He then claims that No Child Left Behind (NCLB) worked, apparently unaware that the national test score gains attributed to NCLB took place before NCLB was fully implemented. I presented this data in the Wall Street Journal on November 17, 2013 (reproduced below). Brownstein waits until the end of his essay to present a brief discussion of the role of poverty. In fact, poverty is the chief factor responsible for the achievement gap. A much larger percentage of minority students live in poverty than do majority students; poverty alone is not the entire reason minority students do not do as well in school, but it is the dominant factor. Citing Reardon's research, Brownstein notes that students living in poverty do poorly on national tests, but does not mention that the negative relationship of poverty and school achievement has been reported consistently in the professional literature for decades. Evidence of the importance of poverty is the finding that American students' rank near the top of the world when researchers control for the effects of poverty and that our middle class students in well-funded schools score do very well on international tests. Overall American test scores are unspectacular because of our very high rate of child poverty, now around 25%. -- invest more in school food programs, improve school health programs, and invest more in libraries and librarians. Until we drastically reduce poverty, let's at least protect children from some of its effects. Paul E. Peterson and Eric A. Hanushek ("Spinning America's Report Card," op-ed, Nov. 8) claim that No Child Left Behind was responsible for a big improvement in National Assessment of Educational Progress scores because scores went up between 2000 and 2009. But nearly all the gains in reading took place before NCLB was implemented. NAEP fourth-grade reading scores climbed from 213 to 219 between 2000 and 2002, accounting for most of the eight-point gain between 2000 and 2009. No Child Left Behind was signed into law in January 2002. There was no gain at all in eighth-grade reading scores between 2000 and 2009. Stephen Krashen is Prpfessor Emeritus, Rossier School of Education, USC, and is the author of The Power of Reading (2004, second edition) and Free Voluntary Reading (2011). Dr. Krashen was the 1977 Incline Bench Press champion of Venice Beach, California and holds a black belt in Tae Kwon Do. He hopes you will follow him on twitter (skrashen) so he can achieve his goal of catching up to Justin Bieber. Increased testing: Nichols, S., Glass, G., and Berliner, D. 2006. High-stakes testing and student achievement: Does accountability increase student learning? Education Policy Archives 14(1). http://epaa.asu.edu/epaa/v14n1/. NCLB and test score gains. Krashen, S . 2013. The Heisenbergian Distortions in Measuring Education. Wall Street Journal, November 17, 2013. Posted at: ttp://tinyurl.com/lvuplu6. Amrein, A.L. & Berliner, D.C. (2002, March 28). High-stakes testing, uncertainty, and student learning Education Policy Analysis Archives, 10(18). Retrieved [date] from http://epaa.asu.edu/epaa/v10n18/. Socioeconomic Status, Race, and Academic Achievement. Stanford: Center for Education Policy Analysis. https://cepa.stanford.edu/content/school-district-socioeconomic-status-race-and-academic-achievement. Control for poverty: Payne, K. and Biddle, B. 1999. Poor school funding, child poverty, and mathematics achievement. Educational Researcher 28 (6): 4-13; Bracey, G. 2009. The Bracey Report on the Condition of Public Education. Boulder and Tempe: Education and the Public Interest Center & Education Policy Research Unit. http://epicpolicy.org/publication/Bracey-Report. Berliner, D. 2011. The Context for Interpreting PISA Results in the USA: Negativism, Chauvinism, Misunderstanding, and the Potential to Distort the Educational Systems of Nations. In Pereyra, M., Kottoff, H-G., & Cowan, R. (Eds.). PISA under examination: Changing knowledge, changing tests, and changing schools. Amsterdam: Sense Publishers. Tienken, C. 2010. Common core state standards: I wonder? Kappa Delta Phi Record 47 (1): 14-17. Carnoy, M and Rothstein, R. 2013, What Do International Tests Really Show Us about U.S. Student Performance. Washington DC: Economic Policy Institute. 2012. http://www.epi.org/). Level of child poverty in US: UNICEF Innocenti Research Centre (2012), ‘Measuring Child Poverty: New league tables of child poverty in the world’s rich countries’, Innocenti Report Card 10, UNICEF Innocenti Research Centre, Florence. Impact of poverty: Berliner, D. 2009. Poverty and Potential: Out-of-School Factors and School Success. Boulder and Tempe: Education and the Public Interest Center & Education Policy Research Unit. http://epicpolicy.org/publication/poverty-and-potential; ; Krashen, S. 1997. Bridging inequity with books. Educational Leadership 55(4): 18-22. Impact of libraries and librarians: Krashen, S., Lee, S.Y. and McQuillan, J. 2012. Is the library important? Multivariate studies at the national and international level. Journal of Language and Literacy Education, 8(1): 26-36. Studies by Keith Curry Lance and Associates: https://www.lrs.org/data-tools/school-libraries/impact-studies/. Small, R.V. and Snyder, J. (2009). The Impact of New York’s School Libraries on Student Achievement and Motivation--- The Phase II In-Depth Study. School Library Media Research, 12. Steve Krashen and child poverty affecting reading scores. It is unbelievable that child poverty and its affects on learning is controversial and discussed. Keep up the good work, Mr. Krashen! Glad you have a black belt in Tae Kwan do.